My friend and colleague Pete Rambo has posted some significant pieces recently regarding the restoration of the entire nation of Israel – both the Jewish and the non-Jewish parts. In this post Pete gives us an excellent commentary on the initiative of our Jewish brethren at Kol Hator to reach out to returning Israelites and educate the Israeli public about this long-expected prophetic event. He also provides some practical points for prayer and action, as well as a point of departure for a stimulating discussion thread. Be sure to read the comments! 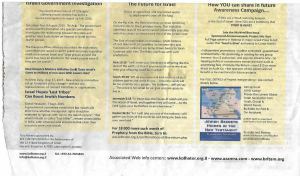 Also check out Pete’s contemplation on “Nationality, Citizenship and The Kingdom” at http://natsab.com/2015/10/24/nationality-citizenship-and-the-kingdom/. Two recent blog posts have generated some good discussion and a fair amount of traffic. 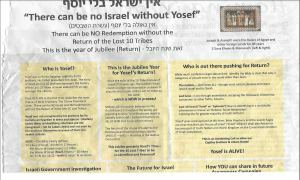 This evening, friend and fellow blogger, Dorothy Wilson, forwarded an email from Kol Hator explaining a bit on their position concerning the return and what flack they are taking for stepping forward with a bold declaration that the ten lost tribes are non-Jewish and coming out of Christendom. I am NOT endorsing the website or their position, I am offering this for further discussion and as a clear statement revealing the things we need to be praying for as we see Abba working this restoration from both sides, Jew and Non. Yup! This is where we need to be: waking up both houses that remain in the state that Isaiah described in 8: 13-18. And from this sanctuary perspective (v.14) and that of chapters 25-27, we are to stand and worship Him and with our prayers and our witness/testimony invoke what He has declared.